This is an easy two-step lesson on how to hula hoop. The general rule is that a hoop should be about hip height. General rule of thumb: The bigger you are, the bigger the hoop should be. Larger hoops will rotate a little more slowly, making it a little easier. Most hula hoops that you can buy at stores like K Mart or Toys R Us are too light and too small. You'll have a lot of fun if you buy a hoop that's the right size for you. 2Put one foot in front of the other, and shift your weight. Hold the hoop against your back. You can start it a little above your waist. 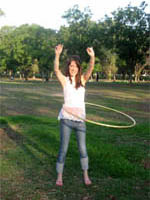 Then, push the hoop around your waist, and shift your weight back and forth on your feet to keep the hoop moving. 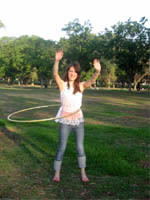 Many people try to move their hips in a circle with the hoop. This actually makes hooping much harder. Put one foot in front of the other and just shift your weight back and forth from foot to foot. It's less of a circular hip motion and more of a rocking motion. Practice! It can take a while to get the hang of it — so don't give up!